RAPID HEATING SPACE HEATER: Built-in Low-650W / High-1000W 2 Levels combined with PTC ceramic heating technology contributes to a rapidly heated up zone. Heating up coverage of 40-90 sq.ft, temperature rises 5-10 degrees over ambient. 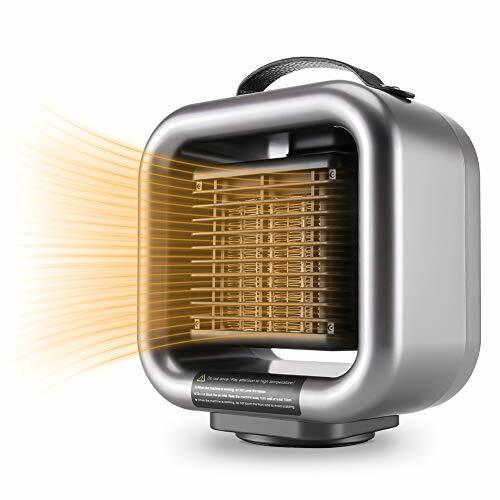 SAFE SMALL HEATER: Mumba fan heater is made with insulated material, safe for everyone; even kids & pets. The inside thermostat will automatically turn off when internal temperature is over 176°F (80°C). Tip-over protection makes this portable heater safe to use in any place (desktop/carpet/bedside). UNIQUE OSCILLATING FAN HEATER: This is the only fan heater with an oscillating feature. 50 degrees of oscillating range. The heated wind blows to larger area. Stay warmer this winter. PORTABLE PERSONAL HEATER: This mini heater is small in size, only 0.14 cu.ft, but powerful in performance. Ultra-convenient for travel, perfect for personal use in office, home, bedroom, tent etc. OTHER TECHNICAL SPECIFICATION: 3 Settings: High Heat, Low Heat, Fan Only; Input Voltage: 100-120V; All Mumba products offer 1 year warranty and lifetime support from our friendly customer service.